Starvaggi's Bucyrus Erie 1250B "Angeline", named after the owners wife. In May of this year Jeff Solley and I were given the opportunity to visit two of Starvaggi coal's mine sites, to photograph some parked equipment. I was expecting to see 2 draglines, but when we arrived. we got a little bonus. Besides the 2 drags, we found a parked BE190B shovel, several be drills, a drill-tek drill, and a really nice D10. 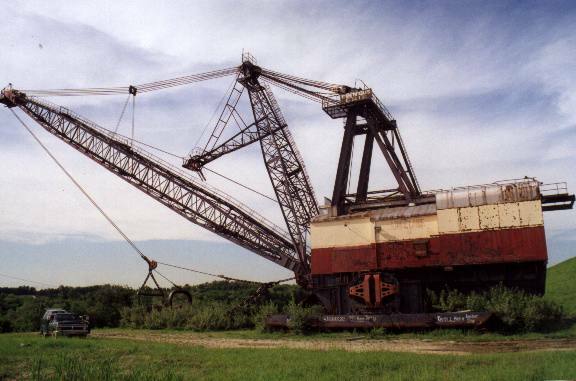 Starvaggi Mined coal in the Eastern Ohio, Western Pennsylvania and Northern West Virginia area for years, but has since gotten out of the mining end of the coal industry, turning instead to transportation and brokerage. As a result, These machines were parked over 10 years ago, and the future is uncertain for them. In order to comply with The mining permits, once the reclamation is complete the machines have to be removed from the land. As you can see from the pictures the reclamation is done, so the machine are just waiting for the inevitable. Our time visiting these machines was limited, we had a lot of ground to cover and not much time to do it in, so I didn't get the chance to take as many pictures as I would have liked. I've just got pictures of the two drags, the 190b shovel and the D10. Click on the links below to see these machines. Hopefully, I'll be able to go back for more pics soon.